Swati's 9 year journey with her venture Sugarcraft India, started with her passion towards art and craft of all forms. Sugarcrafting caught her eye in South Africa where she took her very first sugarcrafting lesson and since then she has been exploring more and more in this art form. Wonderful platform to learn the techniques! After joining it, I have developed a passion for excelling in baking.. Special thanks to the mentors for encouraging us and pushing us to do all the more! Hello. I want to take this opportunity to Thank Swati Ma'am for starting Sugarcraft India. 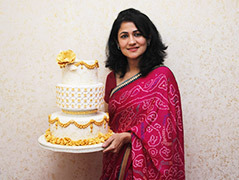 My passion for baking was magnified after taking classes from Sugarcraft India. Swati Ma'am's immense knowledge and her way of imparting the same are just fabulous.The classes are innovative and I highly recommend them for everyone who wants to take this up professionally or for personal enrichment. kudos Swati Ma'am and Sugarcraft..!! To put your career in right direction, one must learn from the best. Sugarcraft India is the best place to be if you are passionate about cake decoration. Thank you Swati for sharing your knowledge and being so supportive.